Reduction of maternal mortality rate is one of the most important health goals of the government of Bangladesh. The present rate of maternal mortality is 194 per 100,000 live births showing that Bangladesh could not achieve the MDG target of 143 per 100,000 live births by 2015. However, the decline in MMR from 322 in 2001 to 194 in 2010, a 40 percent decline in nine years was significant achievement. Now the new goals are set for Sustainable Development Goals (SDG). The 17 new SDGs, also known as Global Goals, the target is to reduce the global maternal mortality ratio to less than 70 per 100,000 live births by 2030. The SDG are also set to end preventable deaths of newborns and children under 5 years of age, with all countries aiming to reduce neonatal mortality to at least as low as 12 per 1,000 live births and under-5 mortality to at least as low as 25 per 1,000 live births by 2030. For Bangladesh, the SDG 3 goal is “Ensure healthy lives and promote wellbeing for all at all ages has the specific targets of achieving i. Under 5 mortality rate to be reduced from 41 to 37 per 1000 live births; ii. Maternal Mortality Ratio to be reduced from 170 to 105 per 100,000 live births. iii. Immunization, measles (percent of children under 12 months) to be increased to 100 percent. iv. Births attended by skilled health staff to be increased to 65 percent. According to Bangladesh Maternal Mortality Survey, 2010 hemorrhage and eclampsia are the dominant direct obstetric causes of death, together responsible for more than half of the MMR followed by Obstructed or prolonged labor (7%) and abortions (1%). Indirect obstetric causes of deaths account for about a third (35%) of maternal deaths. These preventable causes of deaths can be dealt with through effective measures at individual and community level. The neonate mortality is very much associated with maternal and child health. Bangladesh has 24 neonate deaths per 1000 live births , in numbers it accounts for 76,722 neo nate deaths. The infant mortality rate has also declined considerably; from 87/1000 live births in 1990 to 43/1000 in 2011 . The services provided by the healthcare providers are very crucial at the time of child delivery. At the national level, only 26.9% of women are delivering in a facility, mostly in private sector (15.1%) at public hospitals (11.8%) and others facility (2%). The rest (about 71%) are delivered at home. About 2.4 million women deliver at home. The Demographic Health Survey also shows that only 21% of all births were delivered by a doctors and 6.1% by nurse, midwife, auxiliary nurse, which includes qualified doctors, nurses, midwives, paramedics, family welfare visitors (FWVs) and community skilled birth attendants (CSBAs). The rest are looked after by Traditional Birth attendants known as Dais. It is a reality at present and will remain so for the years to come that women, particularly rural poor women will deliver babies at home with the help of the traditional birth attendants, locally known as Dai Mas. The health facilities include District Hospitals under Health Services Wing (59), Maternal and Child Welfare Centers under Family Planning Wing (97), Union Health and Family Welfare Centers under Family Planning Wing (3478). The other higher level facilities are only available in the Medical Colleges and the Capital City Dhaka. The maternal healthcare includes Antenatal Care (ANC), Basic Essential Obstetric Care (BEOC), Comprehensive Essential Obstetric Care (CEOC), Maternal and Child Health Care (MCHC) and Post Natal Care (PNC). The Antenatal Care is provided in almost all UHFWC, MCWC, UHC and district hospitals. The Basic Essential Obstetric Care (BEOC) is available in only few UHFWC, in MCWCs and in most UHCs. Comprehensive Essential Obstetric Care (CEOC) is not available in UHFWCs. But it is available in 62 MCWCs, 77 UHCs and in the district hospitals. 64% of women who gave birth (in the 3 years preceding the survey) received antenatal care from a medically trained provider, up from 55 percent in 2011. This increase is mainly due to an increase in ANC from a qualified doctor. About two-third women received services, but one third (36%) is still out of contact from a qualified doctor. 31% of women have four or more antenatal care visits during the course of pregnancy, an improvement from about one in every four (26 percent) in 2011. Only about one-third women have the required 4 visits for Ante-natal care. In the three years before the survey, 36% of women received postnatal care for their last birth from a medically trained provider within two days of their delivery, up from 27% in 2011. Majority of women (67%) remain outside the services of postnatal care. 42% of births in the past three years were assisted by a medically trained provider. The percentage of births attended by a skilled provider has increased 2.6 times since 2004 due to the increase in deliveries at medical facilities. The national health sector program aims to have 50 percent of all deliveries made by a skilled birth attendant. The target of 50% of all deliveries by medically trained providers will be fulfilled soon, but still 50% will remain out of reach of their services. 37% of births in the past three years were delivered in a health facility. About 63% of births (i.e. two-thirds) were delivered at home. 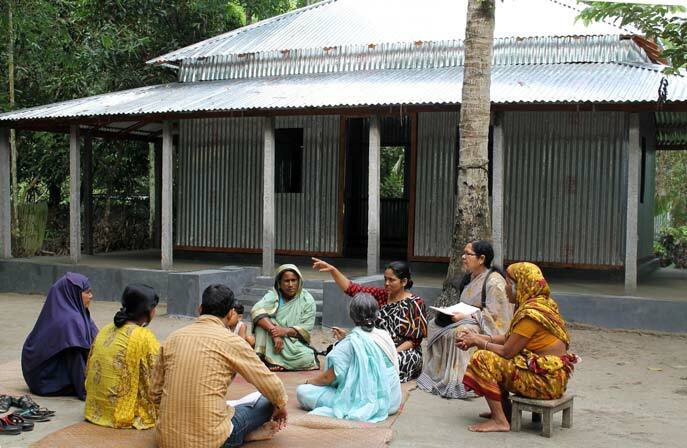 Bangladesh aims to reduce inequity in the use of maternal health services. In 2014,15% of deliveries among women in the lowest wealth quintile occurred in a facility compared with 70% of deliveries among women in the highest wealth quintile. There is a huge inequality in the use of facilities for delivery. Over 85% poor women are delivering at home, in contrast to 70% of the higher income families.They remain in the hands of the traditional birth attendants (Dai Mas). Even among the higher income group about 30% are using their services. 23% of all births were delivered by C-section. Among births delivered in a health facility, 61 percent were delivered by Csection. Health facility delivery results in C-Section a growing concern for maternal health. 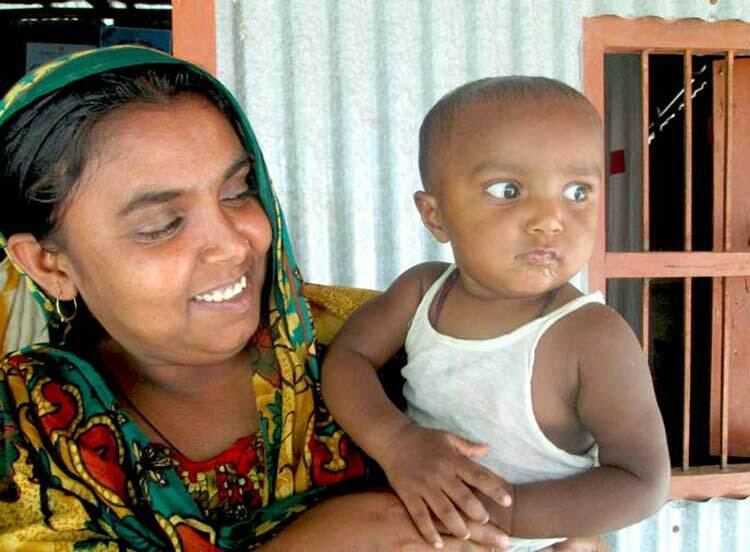 Newborn care practices have improved considerably since 2007 in Bangladesh. Among non-institutional births in the three years preceding the survey, the use of boiled instruments to cut the umbilical cord has increased from 62 percent in 2007 to 83 percent in 2014. The practice of drying within five minutes of birth has also increased from 6 percent in 2007 to 67 percent in 2014. The practice of waiting at least 72 hours after birth to bathe the newborn is more common in 2014 than it was in 2007, having increased from 17 percent to 34 percent. A Dai ghor is a concept, not just a centre, capitalized on the space and place Dais have occupied in their communities for years. It is a place where traditional birth attendents known as Dai Ma are dealing with the technical aspects related pregnancy and child birth, and also handling the social issues that impact the health and well being of mothers and their children. It built on the decades of practical experiences of UBINIG had with the selected Dais had and UBINIG over the years worked with them to increase their effectiveness by helping them to improve their skills and develop new skills to provide basic pre and post natal care and safer home delivery, recognize danger signs of pregnancy complications and the importance of getting urgent and appropriate medical care for such cases, make referrals to the appropriate government health centers, understand the importance of hygiene and nutrition, challenge gender discriminations and harmful traditions and practices that have negative consequences on mothers and children. A pivotal and innovative part of the effort are the DaiGhors --- centers, run by a management committee of 5 senior, skilled Dais as focal points for the Dais' operational and advisory activities. Each DaiGhors serves 3 to 5 villages and was managed by 2 Dais at a time on a rotational basis from the five Dais. Each Dai Ghor serves a population of at least 6500, with about 2500 women in reproductive age and 1400 children under 5. Each Dai ghor has an enlisted 30 Dai mas having experiences in child delivery for 10 to 15 years. The DaiGhors are open from dawn to late afternoon every day of the week. Dai Mas living near the Dai Ghors are available round the clock. They provide basic pre and post natal care and nutritional advice to women of reproductive age, pregnant women and children U5. They also offer the space for government health officials to carry out the EPI (Expanded Program on Immunization) sessions. In terms of the use and effectiveness of the DaiGhors, the initiative demonstrated investment by the community for the success and sustainability of the DaiGhors as centers where women can receive care as well as get connected to the government health systems---the same systems which as individuals the majority of the women in the project villages would not have had the confidence and the trust to seek out. The Dai Mas who used to provide door to door services to the pregnant women are now able to get together in a place and have access to information, discussion, connect to the government health personnel and the centres and to consult each other on the issues related to women’s reproductive health problems. However, the main focus remains the services to the pregnant women. Each Dai Ma has her own “case” of dealing with one or two pregnant women. The average number of pregnant women registered under each Dai Ghor covering 5 villages ranges between 80 -90; Every month, 8 to 9 pregnant women regularly visit (at least four times) the Dai ghors for antenatal care. Dai ghor is a place with non-medical services. Dai Mas check the pregnant women in the Dai ghor or at their homes. 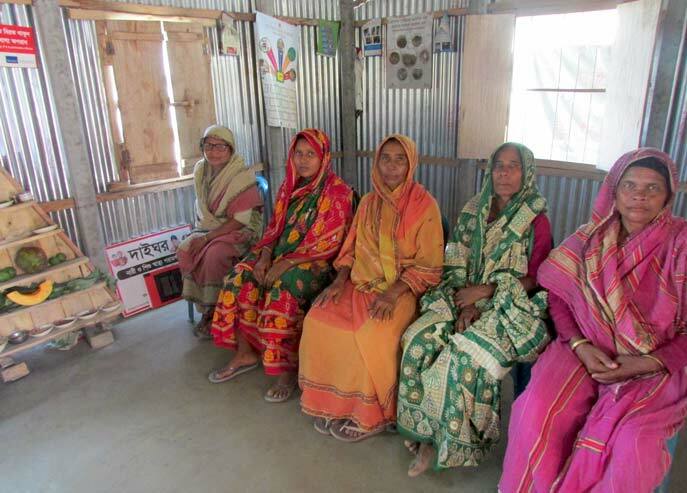 However, women like to come to the Dai Ghor because they get to check blood pressure, weight etc. The major Antenatal care components are monitoring weight, check blood pressure and check up for any signs of complications at different stages of pregnancies so that timely decision for referrals to be made to the government health centres. Each Dai ghor has bloodpressure machine, weighing machine for women and children. Use of the bloodpressure machine has been a great attraction of the Dai Ghor, as Dai Mas never used any equipment before.